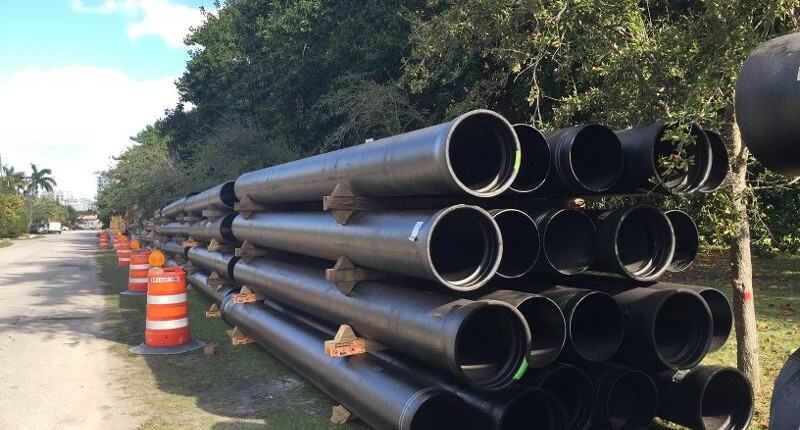 To ease concerns about stormwater drain and road elevation projects, Miami Beach is taking a more educational approach to working with the community. After Central Bayshore residents asked for a delay in raising their streets, City staff and other experts came together in an open house setting to meet with them. At four stations set up in the Miami Beach High School library, homeowners were able to run through flooding scenarios similar to what they might experience, view an animated illustration of how the new stormwater pumps work, ask questions about flood insurance, and learn exactly what the proposed road elevations mean for them. There were 76 residents at the event (in an area with 238 homes). Homeowners waited in line for individual meetings with consultants from AECOM, which demonstrated a new program that shows the calculations in inches of where the crown of the elevated road will be and how that relates to a specific home’s first floor elevation. One of the points of confusion has been road height expressed in engineering terms. The new program makes it easy for homeowners to see how the engineering data converts to inches and how that relates to their individual home’s elevation. So far, data has only been entered for Central Bayshore but the program will eventually be rolled out citywide. Amy Knowles, Deputy Resiliency Officer, said the event “was a great opportunity to try a different format and sit down with residents to share detailed information, answer questions, and hear their concerns.” She said many of the residents who attended liked the open house format, finding it “friendly and informative” while “others would have preferred a more traditional meeting with a presentation.” She said the City will take the feedback into consideration in planning the next event. In the meantime, homeowners who would like individual meetings in their homes, should contact Jeanette Gorgas at 786-239-8862 or via email. More information on the Central Bayshore Neighborhood Improvement Project.